Redesign of batch search experience for enterprise healthcare application. Some of my work is not able to be shown fully here for confidentiality purposes. For more information on this project, shoot me a message and I'll be happy to provide it. ProviderTrust's ExclusionCheck is a self-service product that allows healthcare compliance and human resources managers to screen providers and employees for exclusions. An excluded individual or business is prohibited from receiving Medicare/Medicaid dollars and doing business with them can result in large fines. ExclusionCheck was originally created as a lead generation tool to attract prospective clients for ProviderTrust's higher-end software. Over the years the service has grown its user base and increased its revenue, leading the company to iterate on and improve functionality to better serve its users. A key feature of ExclusionCheck is the ability to upload a ‘batch’ file - that is a spreadsheet containing multiple search criteria to search at once, rather than inputting them one at a time. Over the years, we have added the ability to perform different types of searches using various search criteria. The problem was, these searches were disconnected in the app. As a user, I might have multiple pieces of data to search on one individual, and I would have to upload files and view search results in different places within the application. We received negative feedback on this outdated approach. There was a disconnect between our application’s interaction model and our client’s mental model. We were viewing searching on a per-search criteria basis, while our clients viewed it on a per-individual basis. Working with the ExclusionCheck product manager, we wireframed a variety of potential solutions. We conducted this process internally until we were confident we had a direction that addressed the shortcomings of the system while not disrupting the workflow of clients used to current functionality. I split this effort into two flows - performing a search, and reviewing results. These were the core tasks a user performs as a part of this particular journey. 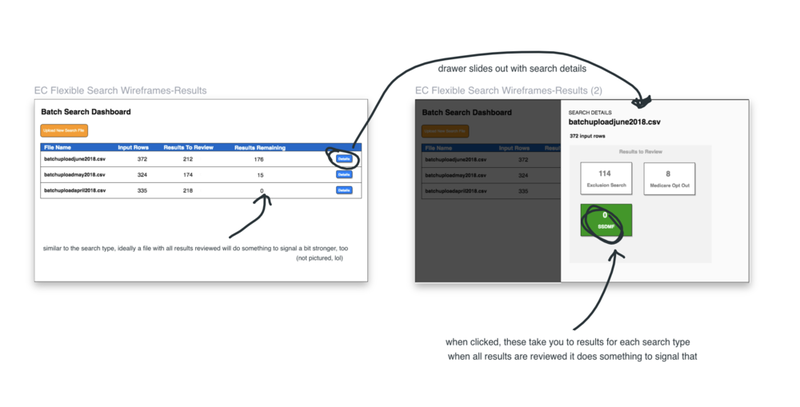 For actually performing a search, we needed to accommodate users who wanted to perform a single search as well as users who wanted to perform every kind of search. The result is a file upload wizard that allows users to upload a file, preview the data they have uploaded, and map that file to appropriate application data headings. This particular project is currently in development as we continue to get feedback for future iterations. Although adding an upload wizard with column mapping allows ultimate flexibility, one of our larger clients complained that going through the process for every file they upload was more tedious. Previously they only had to upload the same template they used every time. An easy fix for this is to allow a templated upload or the full upload wizard. This supports both experienced clients and those new to the application.